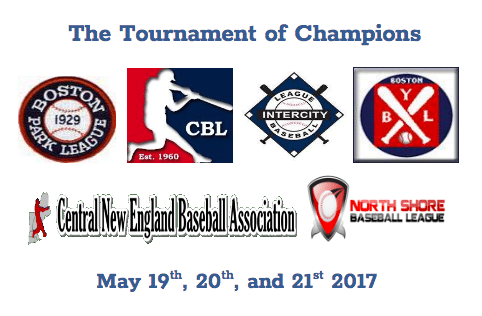 The defending champions of the Boston Park League, North Shore Baseball League, Central New England Baseball Association, Cranberry Baseball League, Yawkey Baseball League and Intercity Baseball League will compete in a single elimination tournament to kick off the 2017 season.Teams have been seeded based on their 2016 winning percentage. The team with the best run differential from the first game or the remaining team with the best 2016 record will get a bye. The other two teams play at higher seeds home field. The highest remaining seed is home team. When: May 19th, 20th, and 21st. 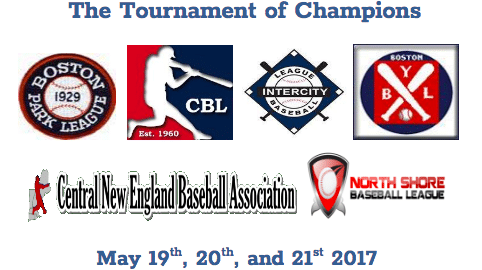 The 2nd round bye can be determined by a coin flip or total runs scored (or any other tie breaker we agree on). Why: To determine a MA State Champion.